I never thought that it would ever come to this. Yesterday I was in disbelief as I read your letter announcing your retirement. Ever since I was a year old, you’ve been in the Yankees lineup. You became my favorite player when I was only two years old and I was able to name all of the Yankees and their numbers (true story). You’ve taught me many, many things over the years. Going back to 1995, your play in Columbus AAA convinced Joe Torre to name you the starting shortstop to open the 1996 season. In typical Jeter fashion, you homered on Opening Day. You became the leadoff hitter and led the Yankees to their first championship in 18 years. You were also a unanimous choice for AL Rookie of the Year. But that wasn’t important to you. You cared more about the championship, and satisfying Mr. Torre and Mr. Steinbrenner. But you weren’t done there. 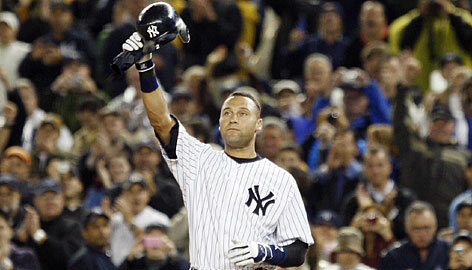 You led the Yankees to a three-peat in 1998, 1999, and 2000 and took home the World Series MVP in 2000. But you didn’t care. You wanted the championship. You were also named an all star 13 times. And while you were thankful for the honor, it wasn’t important to you. You wanted that World Series ring. You taught me to put the team before yourself. I watched as each hit became more memorable, as you passed hall of famers on the hit list. But no hit will be bigger to me than hit number 2722. It came on September 11, 2009, the eight-year anniversary of the tragic attacks. It drizzled all afternoon and the game was in danger of not being played. I came home from school that day and my dad surprised me with tickets. I was so excited and I ran to my room to put on my Derek Jeter jersey. This could be the night that Derek passes Lou Gehrig to become the Yankees all time-hit leader. But as I hopped in the car, the drizzle became worse and my dad said, “I think we should turn around and go home.” I grew upset. “No!” I replied. “We have to go. If there’s a rain delay, we’ll just walk around the stadium. We have to go! It’s Derek Jeter and he has a chance to make history.” My dad complied and we proceeded to Yankee Stadium. There was a rain delay but we waited it out. You hit the ball down the right field line, and history was made. That is one moment I will never forget and I’m thankful that I was a there to see it in person. That season continued and once again, you led the Yankees to another championship. I watched on television as you smacked your 3000th hit into the left field bleachers. And after about a minute of celebration, you said, “We have a game to play,” and got back to business. You went five for five that day, including the game-winning hit. That was what you cared about: helping the team. When you got injured in the 2012 playoffs, I cringed and feared that it was the last time I’d see you on a baseball field. I’ve never seen you in that much pain. Even after you dove into the stands against the Red Sox back in 2004, you seemed to be okay and told everyone you would play the next day. But you weren’t on this play. There was a long path to recovery ahead of you and you took it one step at a time. That first pitch you saw this past July, you belted into the right field bleachers. You taught me to never give up and to battle back when the odds are against you.